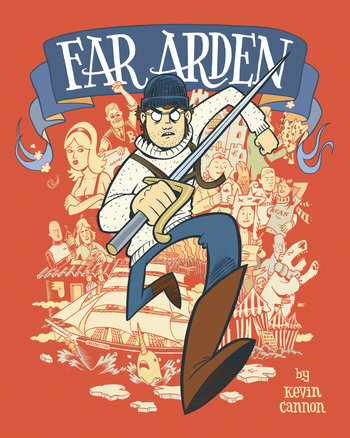 I knew I would read Far Arden sometime, as it’s a lovely looking book by a local author/illustrator of graphic novels. There was nothing to push it to the head of the TBR pile, though, till I was asked to review something for another publication. Then it jumped the queue. Far Arden’s hero, Army Shanks, literally almost leaps off the front cover, surrounded by a lengthy (but not confusing) cast of characters, a complicated past, and a future in which he hopes to find Far Arden, a legendary idyllic island in the Northern Arctic Sea. It starts off as a swashbuckling adventure story: heroes! villains! ex-girlfiends! cute orphans! lost, legendary maps. In spite of many threads and characters, all of this meshes well and swept this reader along at a fast clip, not least because of a clever visual storytelling style and many humorous passages. In the middle, though, this boys’ adventure becomes something more complicated and interesting. Tragedy intrudes on the characters’ adventures, and a thornier combination of story and emotion takes this in a bittersweet direction to a decidedly noir-ish ending. Fun and funny at the beginning, this goes beyond being a thumping good read. Recommended. You can check out the whole book online, but if you like it, I recommend buying it. Not only will you support an artist and Top Shelf, one of the rare publisher’s encouraging artist-owned works, but it’s a gem of an object–small, solid, cloth-bound and covered in the colors of sunset and the sea. It feels great in the hand and will be handsome on a shelf. I’ve linked above to amazon, but recommend seeking it out at your local comic shop. For a fitting explanation of the odd origins of this book, see Kevin’s unique explanation at Powell’s. This entry was posted on Saturday, November 27th, 2010 at 11:03 am	and is filed under Feeling Minnesota, Geek Joy, comic books. You can follow any responses to this entry through the RSS 2.0 feed. Both comments and pings are currently closed. I’ll bring it with me on Tuesday, as well as Tamara Drewe if I get it back. Have you read the Hardy, and are you interested? In typical fashion, I now own a few copies. I am interested in the Hardy, but am not sure how quickly I could get it back to you. Anything I have you might like to read? A, thanks for the offer, but my dance card’s pretty full: Finding Beauty in a Broken World by Terry Tempest Williams for one of my book groups, Await Your Reply for Books and Bars, and a re-read of Gilead for the potentially upcoming Gods and Monsters group. In between there I’m hoping to squeeze the GN Gemma Bovery by Posy Simmonds and Flaubert’s Parrot by Julian Barnes, as follow-up to Mme. B. Right now I’m still reading criticism on the Hardy, but hope to finish today.